Henna mehndi designs have become very popular these days and women adorn their arms and feet with henna designs on all auspicious and festive occasions . 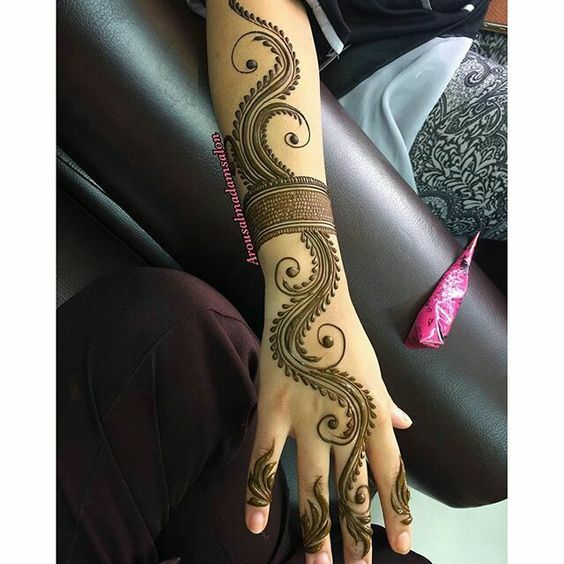 Occasions like baby shower, weddings, eid, diwali etc all call for mehndi application but these days young women prefer simpler designs which are both beautiful and unique. Like flowers but dont want them to be gaudy or complicated? 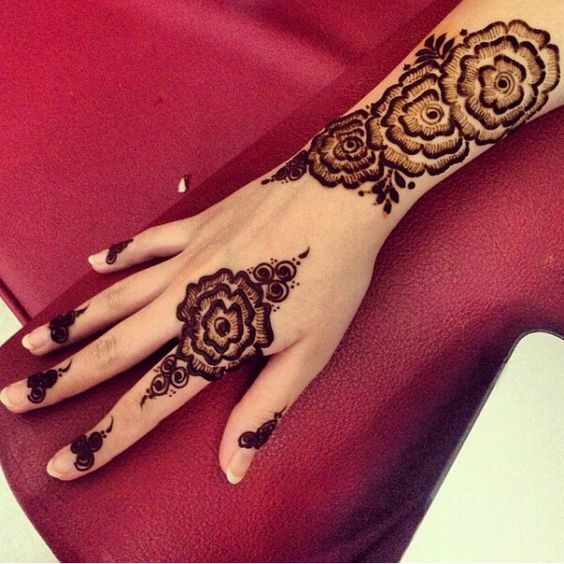 then try the shaded elegant floral henna design. This simple floral mehndi design is easy to do and will catch peoples eye instantly because there is so much of colour on palms. 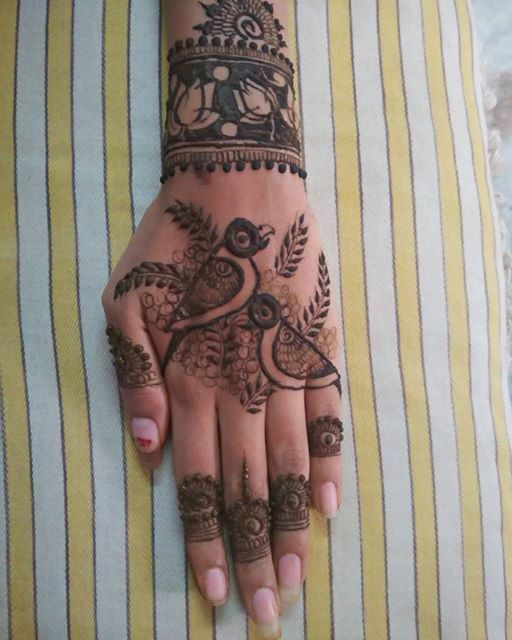 These days there are so many henna designs which concentrate on the arms and back of hands but not on palms but i love putting more emphasis on palms because mehndi ka rang shows up best there. If you also are like me then choose this design as it is both elegant and classy. Young brides, this latest mehndi art is for you. Most bridal mehndi designs are extravagant with it covering major part of your arm but this beautiful exquisite design is relatively simple yet will draw attention from guests at your wedding. And if you hate sitting fr long hours to get mehndi done , this it. 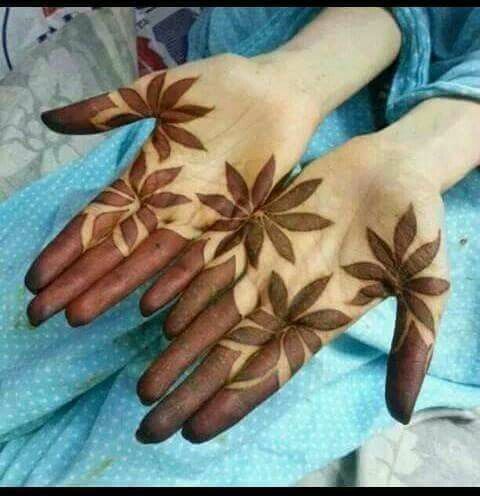 This is Your mehndi. A delicate traditional bride as the focus this mehndi design has lot of swirls, paisleys and dots in it. 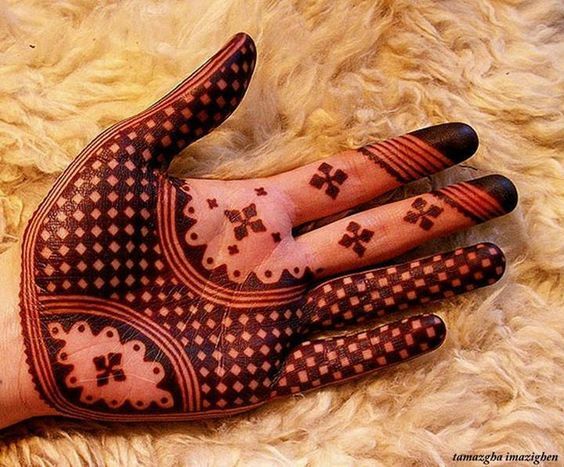 You really need expert hands to do this so make sure your henna artist is experienced enough. 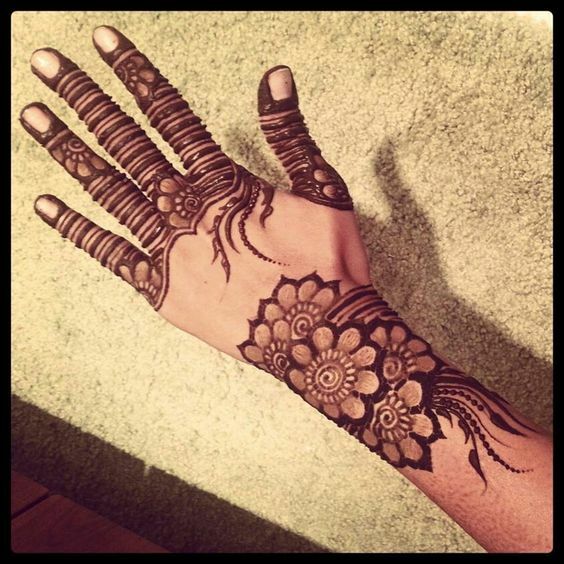 This henna design isnt just for brides, even new brides can try it for eid or karwa chauth. 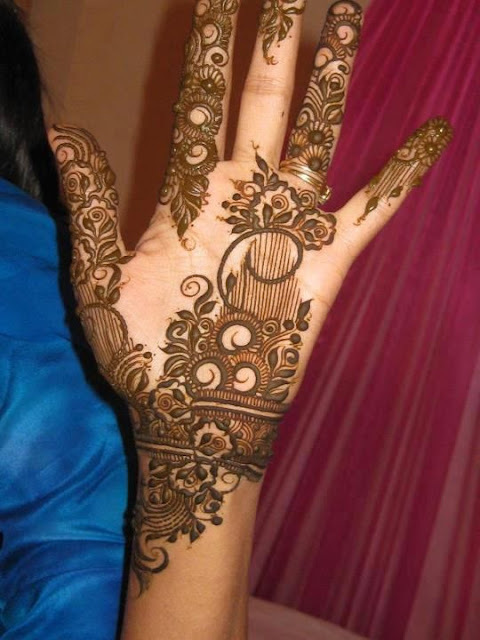 Henna designs at the back of hand are best keple and sleek. This fetaher mehndi deisgn is ideal which has just some solid filled in swirls for leaves and a curved quill like pattern which ends in a peackock feather. Paisleys are the most popular motif in mehndi designs thanks to its feminine and delicate look. This very intricate design has a paisley as its focus and lots of thin strokes and swirls around it to look beautiful and alluring. Floral motifts are super pretty and chic but these huge shaded floral are something new and unique. 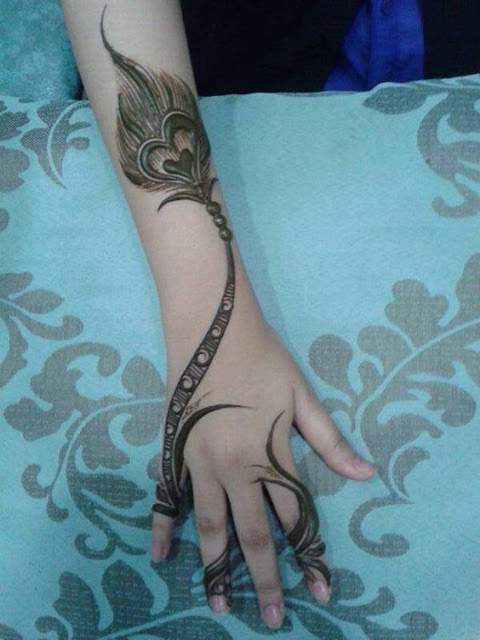 This mehndi design has just one huge flower on the upper hand while three flowers grace the arms and there is lots of spaces left empty for a classic elegant feel. I love how flowers come alive after the mehndi green is scraped off and this design will also look amazing after washing off. You can put this design both in the back or front of hands. This variation of arabic henna mehndi design with flowers may look very common but the real beauty lies in the pattern on fingers. The paralell lines with some flowers inserted here and there look different and are also easy to put . Forget flowers here is a stunning henna design with squares. 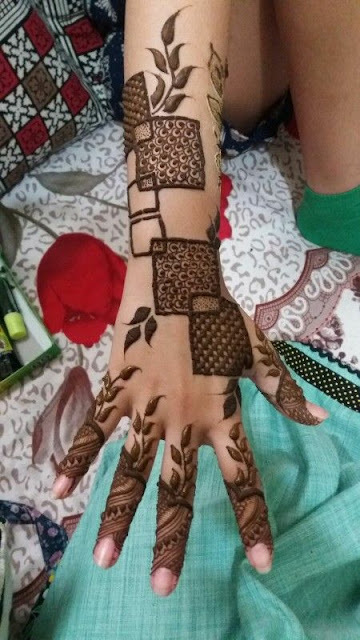 I love this geometric and leaves mehndi design to core and will definitely give this a try soon. Another flower free mehndi design which looks equally wonderful and the best part is it is super simple and even beginners can give it a try. You can use this design on front and back of the hands. I personally rarely apply henna mehndi on feet even after marriage because it is just too time consuming but with a designas simple as this anyone can give a try. I love heart mehndi patterns in henna as it looks unique and is a nice departure from your usual paisleys, flower, peacock motifs. 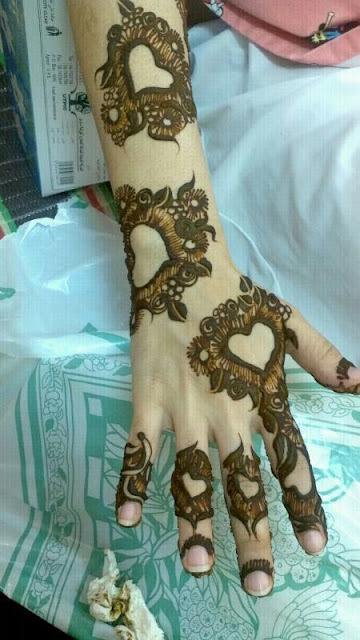 This mehndi design is best for valentines day, engagement and even weddings. This also easy to do and you can do it on both sides of hands. All you have to do is sketch in some hearts and surround them with strokes, leaves and flowers. 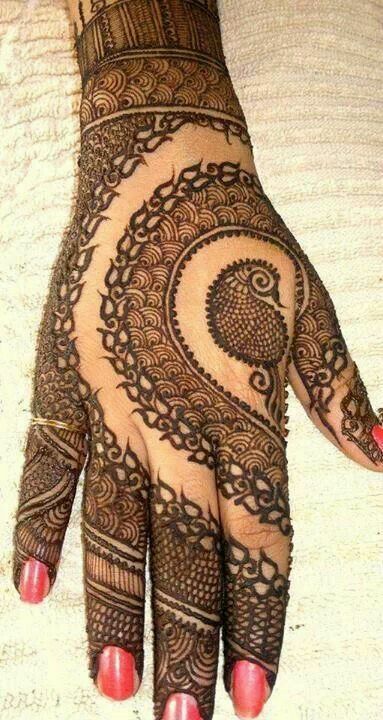 No intricate patterns but such a stunning elegant mehndi design. A cluster of small solid flowers and swirl leaves make this design beautiful and different too. Try this when you have less time on hand. 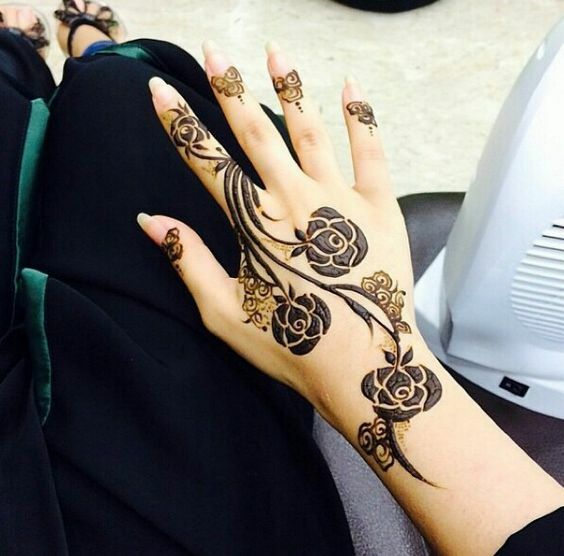 Even startes should give this henna design a try. Lace glove mehndi designs have been very popular in recent times where the mehndi design is sketched to resemble a lace glove. This lace mehndi design gives an illusion of sheer lace glove and is best for brides it they want to go contemporary with fusion indian wear for their wedding. This is a nice simple henna tattoo design for girls who dont like heavy designs . A lot of concentric circles are drawn which are held together with swirl leaves. This design is best for simple occasions like eid, diwali or aniversarries. Flowers have been a very important part of mehndi designs but they have been used with many other motifs . 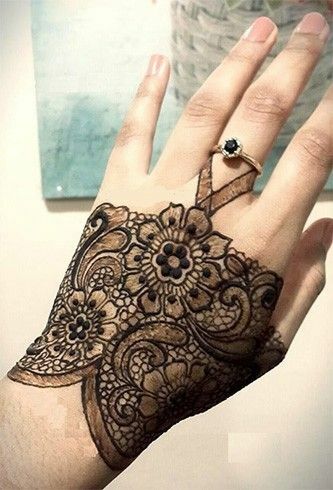 This mehndi design using just simple flower motifs all over the hand with a bracelet like design as base. This looks so much like an embroidery or art work on a dupatta. Love. Rose mehndi designs are very popular and this minimalist rose mehndi art is beautiful and alluring. I love how this design looks more like a tatoo than a henna art. Peacock mehndi designs are very popular and peackock motifs are used librally these days making them very common. Try using brids like parrots in a henna design to make it truly stand out. In this design two birds on branches form the main base while fingers have small intricate floral motifs. The wrist has a bracelet like shaded floral design. this design can be nice valentines idea (love birds) or even good for an engaement or even for wedding of a contemporary bride. 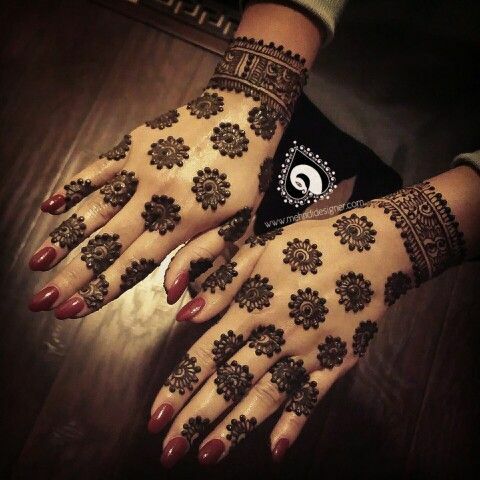 This design ofcourse requires a lot of concentraion and an expert hand but is a beautiful way to show off your mehndi skills. Feet Henna are so yesterday! lets try some sole henna shall we? 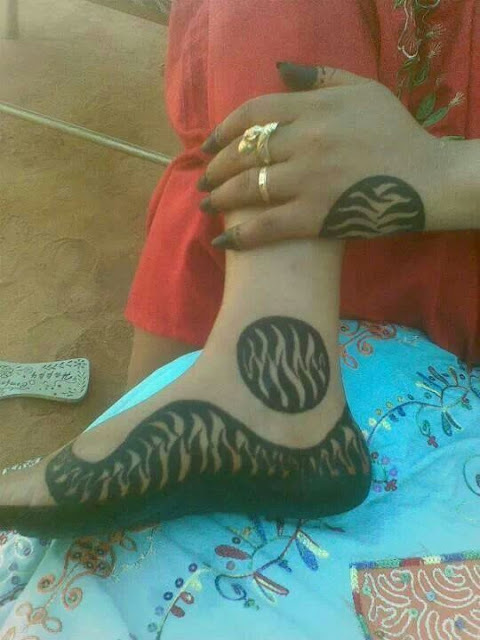 This simple yet elegant mehndi design on soles of feet look just beautiful. 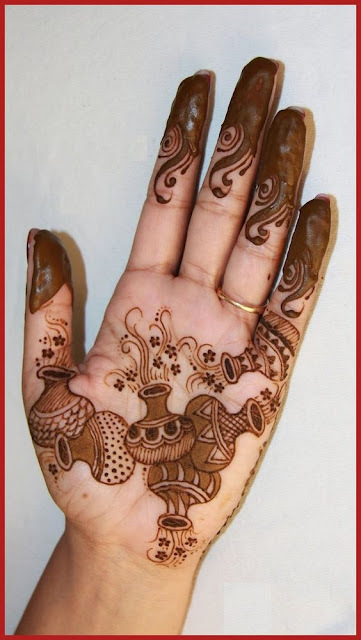 Sole henna is best for bride for that extra pampering and also because there are many rituals and customs where the brides feet are a main focus point. This design is also suitable for young girls with tiny feet. Do you like your palms to be the main focus? Try this bold and beautiful mehndi design which has cheques pattern and has a lot of colour. 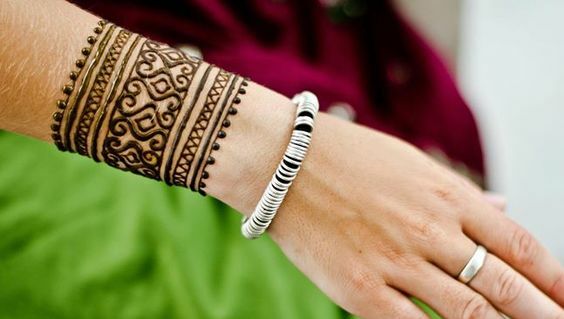 Try this mehndi design if your outfit is light coloured for a contrasting effect. Pastel indo-western outfits will work best with this design which is a nice break for all the extravagant intricate henna designs. This is a nice design which be worn by women of all ages on any occasion. Mehndi is considered essential part of look for many occasions but it is best to experiment a bit and try an offbeat design. 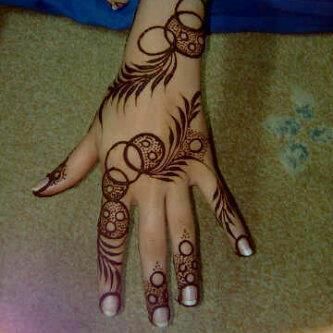 this mehndi design isnt too basic or common but still is very in the comfort zone keeping things very safe. 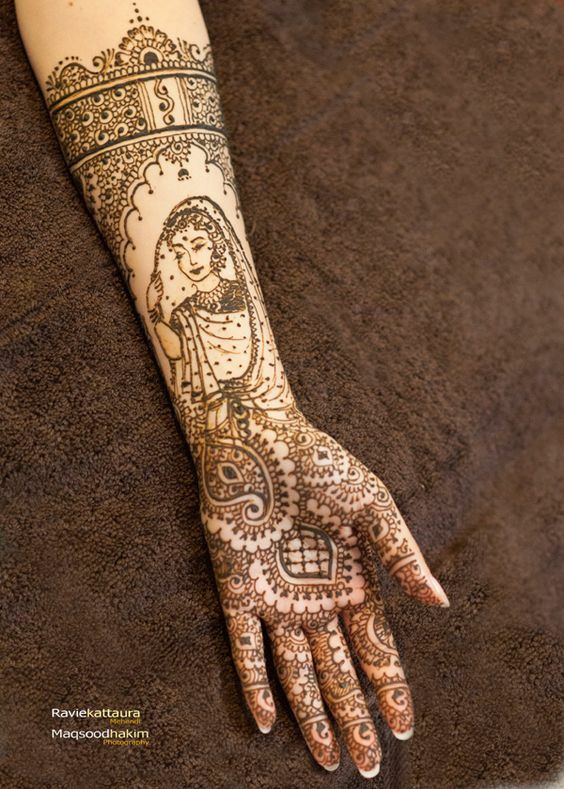 Use a mehndi cone with a sharp small opening to help you get more precise thin lines.